The internet is all about content and while I am in Cali still waiting for a conference to start in San Diego. I am going to write up another affiliate blog income series. This series is more for SEO people and users who want free traffic. But also is meant for readers who want to utilize the content to make the user take action. Content is important… everyone says it is King and it is. The main factor is revolving your content around keywords so you get picked up by search engines and get rank fairly quickly. So how do you really do this? It is pretty simple. First just use Google Keyword tool and enter some actionable keywords and let google to it’s job. You will find a bunch of keyword ideas to start writing your content on. Now the main results should give you some good keyword ideas on what to write. What I tend to do is sort by competition least to highest. The reason why I do it this way is to write articles around the least competitive keywords. This way I can get ranked fairly quickly for a topic, especially if my content is unique. You can write the content yourself or outsource it. Either way you want your content to revolve around that keyword so you can get ranked. In between the keyword targeted articles, I write other articles that are off topic but show some personal attention to it. Giving the user a break. Also this gives you the opportunity to catch keywords that you may rank for and start growing that keyword base with articles. Meaning… you may rank for a new keyword which is getting volume. It is important to rank for other keywords and then build that specific keyword around actionable keywords. Let’s say you are starting to rank for “womens health iphone app” via your analytics or referring keywords. 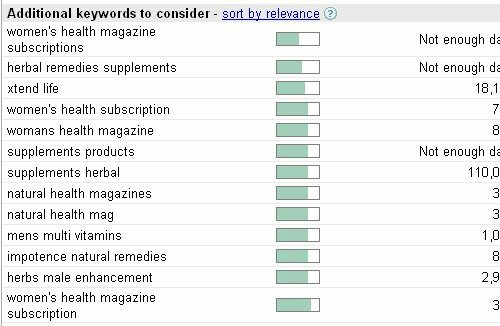 I would start to write content around that keyword but with pre-sellable or actionable keywords such as: subscription, buy, register, etc. Creating these new keyword terms can get you volume and get you ranked to be number one really easy and very fast. But sometimes writing or paying for unique content can be hard… so the next best thing is to automate content. I use Mass Article Control to automate a lot of my content. I simply just search for an article in any article directory such as goarticles.com copy the content and then insert it in this program. What this program does is rewrite the content and changes certain words. You will have to read the content over to make sure it makes sense, but it beats writing content. The program changes the context of the article from 20%-60% and you can decide what article you want to use out of the thousands it generates for you. Another program or service I use is SEO Link Vine. This service creates content for you in exchange for backlinks. This only works with WordPress sites which most of my sites are and which your sites should be as well. Users create content base on categories and sub categories. You approve the content or disapprove, so you have control of what content is being published on your site. The only thing they require for you to do is to add their link generating a backlink for them. If you utilize the content right you can still target users to take action on your offer or product. Remember content is important especially when it comes to SEO and free traffic. So writing your own content around actionable keywords or utilizing services or content to create your content can benefit your new blog site around your affiliate offers. I personally know writing content can be annoying and tiring.